What is fire? What components are necessary for something to burn? Can things burn without oxygen? In water? From ancient times people were puzzled by the nature of fire, considering it (along with water, earth and air) to be one of four basic elements everything the Universe is composed of. Believe you or not, but the attempts to understand the nature of fire laid the foundations of the modern chemistry. Accordingly, this semilab is the best chance for a beginner to get acquainted with foundations of chemistry. 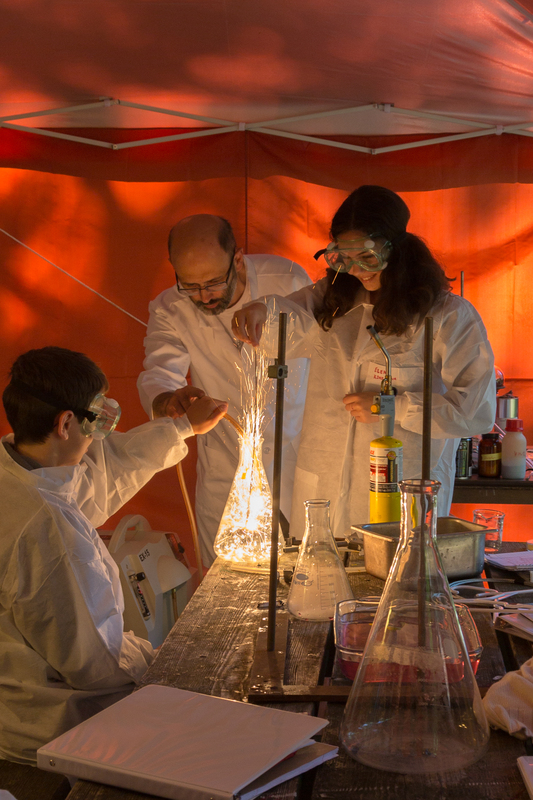 During this semilab, we will discover the chemistry behind the fiery phenomenon. You will replicate the experiments that scientists of the XVIII century used to understand fire. We will study the composition of air, and the role its components play in supporting combustion. We will observe the emission spectra of different materials, which will lead us to an understanding of how chemical properties relate to color. We will rediscover new chemical elements, and play forensics by detecting minuscule traces of certain substances. And yes, we will burn things in water, and prepare something interesting to show to other campers!